In renal transplant, there is a well-known deficiency in organ supply relative to demand. Live donation provides superior results when compared with deceased donation including a better rate of graft success and fewer immunologic complications. This deficiency in organs leads to significant morbidity and mortality rates. Alternative avenues have been extensively explored that may expand the live donor pool. They include altruistic donation as well as paired and pooled exchange programs. Altruistic donation is a truly selfless act from a donor unknown to the recipient. Kidney paired donation involves 2 incompatible donor-recipient pairs swapping donors to produce compatibility. Pooled donation involves at least 2 pairs, and can take the form of domino chains in which altruistic input sets up a chain of transplants, in which each recipient’s incompatible donor makes a donation for the next recipient. Despite application of these various methods, there lie extensive ethical issues surrounding them. Misconceptions frequently occur; for instance, the perceived benefit that donating an organ to a loved one is greater for a related donor than for an altruistic one. Additionally, it is frequently believed that immunologic incompatibility offers coerced donors liberation from surgery, and that overcoming these barriers by introducing exchange programs provides vulnerable donors less protection. This article explores these and other complex ethical issues surrounding the various methods of expanding the donor pool. The authors offer opinions that challenge the ethical issues and attempt to overcome those views that hinder progress in the field. The benefits of organ transplant are undeniable. The gift of life is an invaluable offering to anyone. Thousands of organ recipients have improved quality of life after transplant, and in some cases (eg, when compared to dialysis in end-stage renal disease), transplant is inexpensive1 and provides superior long-term survival.2 However, despite its benefits, transplant remains highly controversial. For many, accepting an organ from another person goes against strong cultural and religious beliefs: It is thought that by accepting this gift, one’s identity may become lost or confused, and it also may interfere with spiritual liberation or reincarnation after death. Additionally, some persons say we should be directing limited resources and health care provisions to preventative medicine and primary care, rather than toward a costly extension of life. There is a grave mismatch with regard to the supply and demand for organs. In the United States, patients’ rate for end-stage renal disease continue to rise at 7% to 8% per year.3 However, the number of kidneys available for transplant remains limited. Worldwide, the source of donors has expanded from the traditional deceased donors to living donors. (The first successful kidney transplant from a live donor was performed in 1953, in Boston, USA.) Most kidneys from living donors are from relatives (who provide a high degree of major histocompatibility complex matching, leading to encouraging, long-term results). With the practice gaining momentum in the 1990s, living, unrelated donors (with an emotional, rather than a genetic connection to the recipient) have donated their organs. It is speculated that even with an adequate supply of deceased donors, many centers would continue to use live donors. When compared with deceased organs, benefits include the fact that recipient and donor health can be optimized for retrieval and transplant procedures; and more importantly, kidneys from live donors offer longer graft survival4 and thus, better quality of life for the recipient. The superior results from live donors are observed despite advances in immunosuppressive drugs. This method is also the most cost-effective renal replacement currently available for end-stage renal disease.4 However, more donors are needed and live donors, who are unrelated to the recipient and who are donating their organs with a purely altruistic intent, are being accepted. This practice was made legal in the United Kingdom in 2004 under the Human Tissue Act and has also been used in the United States.5 But there is still great variation internationally with regard to implementing donation methods because of ethical and legal restrictions. An additional attempt to increase the donor pool, and overcome immunologic incompatibility between donor and recipient, involves adding both individuals as a “pair” to a pool of other incompatible “pairs.” The simplest form of this so-called pooled donation involves kidney-paired donation, a concept conceived in 1986 by Rapaport,6 which involves 2 incompatible donor-recipient pairs swapping donors to produce compatibility, and thus, 2 successful transplants (Figure 1). In 2009, teams across the United Kingdom expanded upon this paired-donation scheme to involve 3 incompatible donor-recipient pairs,7 and in 2010, an American team successfully performed an 8-way paired exchange.8 Further attempts to increase transplant numbers have introduced altruistic donors to exchange programs. 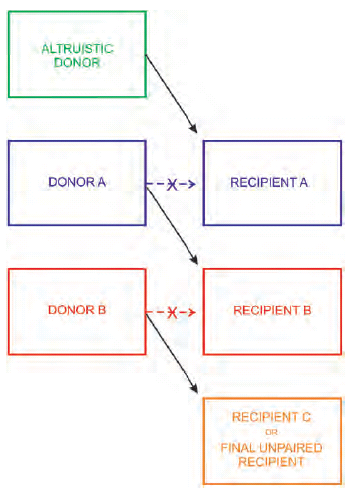 One example is domino-paired donation,9 which involves an altruistic donor initiating a chain of transplants, in which each recipient’s incompatible donor makes a donation to the next recipient (Figure 2). The chain is terminated when the final recipient’s incompatible donor provides his or her kidney to a patient on the deceased-donor wait list. Rapid acceleration of such exchanges demands thorough ethical evaluation, especially when complexity increases with altruistic input, which poses its own unique ethical dilemmas. We also will consider the ethical issues ingrained in the use of altruistic donors and pooled kidney exchange programs, both individually and when combined in novel exchange algorithms. This infliction of harm to the donor can be justified and often overridden by its beneficence, both psychological and moral. In fact, if we suggest that altruistic donation is donating without coercion or relation to the recipient (unlike the related, live donor, with an emotional or genetic attachment to the recipient), then we suggest that it is less beneficial to the related donor, whose underlying obligation taints any pure, altruistic intent. For an equal degree of pain that is encountered as a result of donation, the benefit to the altruistic donor outweighs that of the related donor, thereby supporting altruistic donation. Acceptance of altruistic organ donation centers in respect for patient autonomy often follows the argument that. . . Unfortunately, there are some who believe that indulging in altruistic organ donation sets transplant medicine on its way toward commercialization of vital organs. In turn, it is believed that this could lead to blackmail, exploitation, emotional, and financial problems; however, there is no evidence at all suggesting that a desire to donate an organ to a stranger is necessarily a pathological obsession.15 Indeed, with strict regulatory framework and criteria for selecting potential altruistic donors, the slippery slope tainting of this practice can be monitored and managed effectively. Our views echo those of Shirley Harrison (Interim Chair of the Human Tissue Authority in 2006) who described a recent altruistic case. . .
To satisfy the aim of increasing the live-donor pool, many centers across the world have explored donor exchange programs. One of the United Kingdom’s first pooled transplant protocols was done in December 2009 and involved collaboration between our institution (Imperial College Healthcare Trust), Guy’s and St Thomas’ NHS Foundation Trust, and the Royal Infirmary of Edinburgh. In a recent issue of the British Medical Journal, the authors reported that, “Surgery started simultaneously at 9 AM at all 3 centers. All 6 patients had to be in good health, on the same day, for the operations to proceed. Once the 3 kidneys were retrieved, they were packed in ice and transported by plane between Edinburgh and London, then by ambulance between the London hospitals.”17 This demonstrates that in addition to the favorable outcomes observed by the case, positive lessons were learned regarding the logistic feasibility of undertaking such a program in the United Kingdom. To ethically justify such programs, 4 principles of biomedical ethics (beneficence, nonmaleficence, justice, and autonomy) must be considered both on the part of the donor and the recipient. As previously stated, live donation is ethically accepted because the medical harm associated with kidney resection, is outweighed by the psychological benefit gained by restoring health to a loved one. With respect to pooled donation, this crucial justification is not altered by the fact that the donor’s contribution to their loved one is indirect, despite some suggestions that, in kidney exchange, the benefit to the donor is more “diffuse”18 and that the psychological pressure placed upon them is greater.19 Therefore, if living donation is justified by beneficence outweighing breach of nonmaleficence, then so too, must be pooled donation. Even if it were universally accepted that this was not the case, and that the emotional benefit to the donor did not override the harm they invariably accept, it still would be difficult prohibiting live donation, and therefore, pooled donation on these grounds alone, as overriding a donor’s autonomy would be unethical. It is suggested that immunologic incompatibility offers the reluctant or coerced donor liberation from surgery, and that overcoming such barriers by introducing exchange programs will provide vulnerable donors less protection.20 This, however, is one of many consequences of exchange programs, and not an inherent ethical argument against a kidney exchange program itself. This is comparable to the aforementioned example of altruistic donors possibly paving the way for commercialization. This “slippery slope” is not an inherent ethical argument against allowing strangers to donate; said risk may be reduced by implementing protective measures. Likewise, the risk of affording donors less protection against coercion will force more-stringent psychological screening for the donors. This will provide us the opportunity of improving our current protocols. There is a suggestion that exchange programs may worsen this imbalance in allocating organs among the various ABO blood groups. This is because group O donors are unlikely to be entered into exchange programs (as only positive crossmatching would render a live group O donor ineligible to donate their organ to a loved one directly). Ideas to overcome the issue have included asking O group donors to participate in exchanges, despite their ability to donate directly. However, ethical objections have limited acceptance of such programs because of a difference in the degree of altruism that is asked of the 2 donors.22 Unfortunately, this inconsistency in equity is shared with other forms of pooled donation. To the detriment of those on the deceased donor wait list, there may be preferential use of O group altruistic donors in Domino-paired donation and nonsimultaneous extended altruistic donation programs. This may lengthen already prolonged wait times experienced by group O wait list patients. As a counter argument, this disadvantage to the O group wait list patients may be ethically justified if the number of transplants generated by the exchange schemes is substantial.25 However, such studies remain to be published. There are greater ethical issues ingrained within nonsimultaneous extended altruistic donation specifically. As opposed to Domino-paired schemes, where the final donor provides a kidney to a wait list recipient, nonsimultaneous extended altruistic donation chains are never-ending and donors act simply as “bridges”, until the next chain can be initiated. This means that for each these program that begin, 1 altruistic donor is removed from the pool feeding the deceased donor wait list. From a utilitarian perspective, more transplants are performed within these “bridge” programs compared with a single altruistic donor providing a kidney to a single recipient on the wait list; thus, the nonsimultaneous extended altruistic donation program has a better outcome. Furthermore, recipients within the “chain” would be on the deceased donor wait list anyway, and are subsequently, removed from it, thereby allowing those on the list without live donors a greater chance of receiving a kidney from a deceased donor. We hope this transplant helps raise awareness of the powerful impact of the kindness of strangers and the importance of organ donation. . . .
A sentiment that we, at our institution, share. “Strict privacy and confidentiality should be maintained for each donor-recipient pair.” This quote summarizes the first ethical analysis of exchange programs by Ross in 1997.18 It is justified in the paper by the emotional conflict that may be created by 2 recipients experiencing differing levels of success concerning their outcome. Although we acknowledge this point and understand the reasons behind it, we feel it important for recipients to express their gratitude to their donor and thus, cement their unique bond upon which the donor and recipient agree. The aforementioned “gift of life” that a kidney donor provides is to be celebrated by both participants before surgery to ensure that any complications during the procedure do not taint the “gift” with guilt. If the recipient wishes to express gratitude to an equally willing donor, then the opportunity must not be wasted, regardless of the outcome of either donation. I am really looking forward to meeting Barbara [an altruistic donor]. I was told in the dialysis unit back in July that I was getting a living donation. I didn’t know that someone could do this. It’s been quite a shock. An immense mismatch between supply and demand has led to a desperate need to increase successful kidney transplants. Live donation previously has been justified based on beneficence outweighing breach of nonmaleficence (with regard to the donor) and respect for donor autonomy. There has been a natural progression over the decades to permit live donation in the first instance, to live donation by a genetically related donor, to live donation by an emotionally related donor, and finally to live donation by a completely unrelated (both genetically and emotionally) altruistic donor. Despite fears of descending to commercialization, we believe that accepting an altruistic donor is the next natural step and is ethically justified on both a utilitarian and ethical level. Furthermore, pooled donation, including kidney paired donations, Domino-paired donation, and nonsimultaneous extended altruistic donations, all have the potential to ease the transplant burden, albeit at the disadvantage of group O wait list patients. Despite this shortcoming, these programs provide a strong solution to the organ crisis. Rather than dismissing them based on failing justice, we should aim to efficiently devise strategies to overcome limitations and continue their already successful implementation. Port FK, Wolfe RA, Mauger EA, Berling DP, Jiang K. Comparison of survival probabilities for dialysis patients vs cadaveric renal transplant recipients. JAMA. 1993;270(11):1339-1343. Gatchalian RA, Leehey DJ. Mortality among patients on dialysis, patients on dialysis awaiting transplantation, and transplant recipients. N Engl J Med. 2000;342(12):893-894. Weale AR, Lear PA. Organ transplantation and the Human Tissue Act. Postgrad Med J. 2007;83(977):141-142. Rapaport FT. The case for living emotionally related international kidney donor exchange registry. Transplant Proc 1986; 18(suppl 2): 5-9. BBC News Web site. http://news.bbc.co.uk/2/hi/health/ 8552162.stm. Three-way kidney transplant success. Accessed: March 4, 2011. Northwestern Memorial Hospital News Web site. http://www.nmh.org/nm/eight+way+paired+exchange. Sixteen Patients, Eight Kidney Transplants, Three Days, One Life Changing Event. Northwestern Memorial Performs Eight-Way Paired Kidney Exchange Transplant; Among Largest Single-Center Paired Exchanges in the United States. Accessed: March 4, 2011. Montgomery RA, Gentry SE, Marks WH, et al. Domino paired kidney donation: a strategy to make best use of live non-directed donation. Lancet. 2006;368(9533):419-421. Mueller PS, Case EJ, Hook CC. Responding to offers of altruistic living unrelated kidney donation by group associations: an ethical analysis. Transplant Rev (Orlando). 2008;22(3):200-205. Heyd D. Obligation and supererogation. In: Reich WT, ed. Encyclopedia of Bioethics. Revised ed. New York: Simon & Schuster Macmillan; 1995:1833-1838. Rodrigue JR, Pavlakis M, Danovitch GM, et al. Evaluating living kidney donors: relationship types, psychosocial criteria, and consent processes at US transplant programs. Am J Transplant. 2007;7(10):2326-2332. Spital A. When a stranger offers a kidney: ethical issues in living organ donation. Am J Kidney Dis. 1998;32(4):676-691. Ross LF. Solid organ donation between strangers. J Law Med Ethics. 2002;30:440-445. Sadler HH, Davison L, Carroll C, Kountz SL. The living, genetically unrelated, kidney donor. Semin Psychiatry. 1971;3(1):86-101. Human Tissue Authority Web site: http://www.hta.gov.uk/ newsandevents/htanews.cfm/383-Altruistic-kidney-donor-meets-stranger-recipient-in--UK-first-.html. Altruistic kidney donor meets stranger recipient in ‘UK first. A donor who gave a kidney to a stranger has met him for the first time today. Accessed: March 4, 2011. Wise J. First three way kidney transplantations were carried out in UK. BMJ. 2010 Mar 5;340:c1343. Ross LF, Rubin DT, Siegler M, Josephson MA, Thistlethwaite JR Jr, Woodle ES. Ethics of a paired-kidney-exchange program. N Engl J Med. 1997;336(24):1752-1755. Mazaris E, Papalois VE. Ethical issues in living donor kidney transplantation. Exp Clin Transplant. 2006;4(2):485-497. Mahendran AO, Veitch PS. Paired exchange programmes can expand the live kidney donor pool. Br J Surg. 2007;94(6):657-664. Glander P, Budde K, Schmidt D, et al. The 'blood group O problem' in kidney transplantation--time to change? Nephrol Dial Transplant. 2010;25(6):1998-2004. Ross LF, Woodle ES. Ethical issues in increasing living kidney donations by expanding kidney paired exchange programs. Transplantation. 2000 69(8):1539-1543. Segev DL, Gentry SE, Warren DS, Reeb B, Montgomery RA. Kidney paired donation and optimizing the use of live donor organs. JAMA. 2005;293(15):1883-1890. Rees MA, Kopke JE, Pelletier RP, et al. A nonsimultaneous, extended, altruistic-donor chain. N Engl J Med. 2009;360(11):1096-1101. Woodle ES, Daller JA, Aeder M, et al. Ethical considerations for participation of nondirected living donors in kidney exchange programs. Am J Transplant. 2010;10(6):1460-1467. Figure 1. Paired Kidney exchange – Donor A and recipient A are incompatible. Donor B and recipient B are incompatible. Donors are “exchanged” to produce 2 compatible pairs, that is, donor A and recipient B plus donor B and recipient A. Figure 2. Domino Paired Donation – An altruistic donor is paired with recipient A, who has an incompatible donor (donor A). 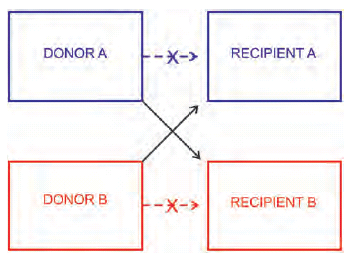 Donor A is paired with recipient B who has an incompatible donor (donor B). Donor B extends the chain by giving to recipient C. The chain is terminated when an incompatible donor is paired with an unpaired (ie, wait list) recipient (eg, donor B to final unpaired recipient).